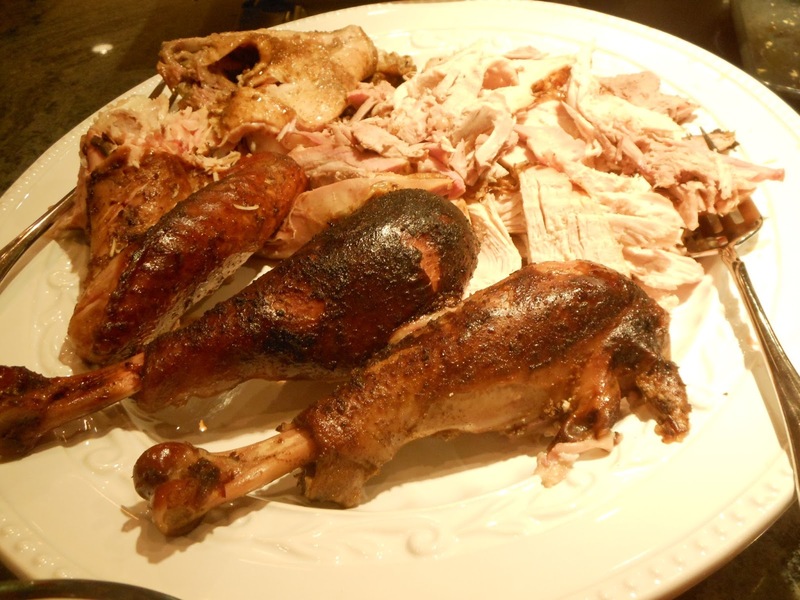 Our daughter and son-in-law executed this, our first attempt at smoking a turkey, with advice from his father, an all-round barbecue and smoker expert, and from the excellent website called Smoker Cooking. To make the brine, first remove all of the cloves of garlic from the bulb and crush them. Fill a large pot with water, measuring and making note of the volume used. 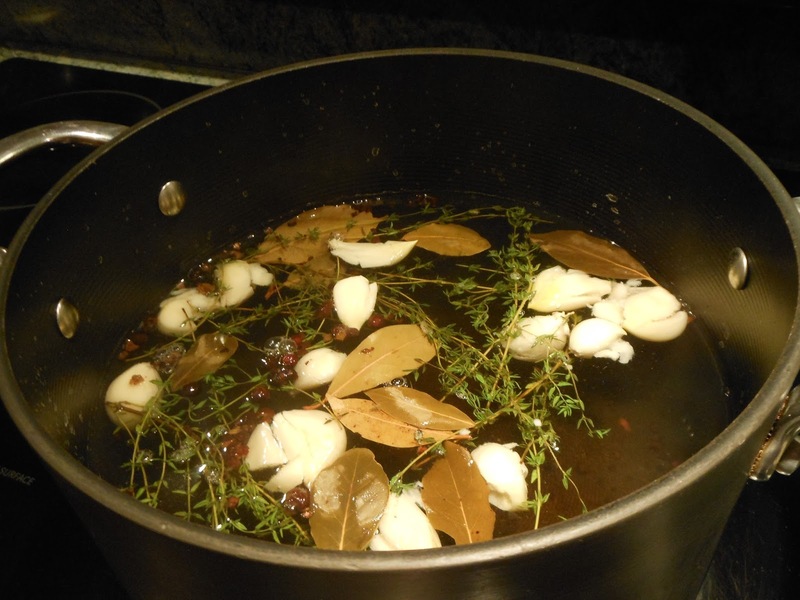 Add the garlic cloves, allspice, juniper, sea salt, stevia, bay leaves, and thyme to the water and bring it to a boil. Allow the brine solution to cool to room temperature. When the brine is cool, wash the turkey inside and out, removing any loose fat, excess skin, and any turkey parts included in the package. Gently slide a blunt spatula between the breast meat and the skin until the skin on both sides of the breast is separated from the meat. 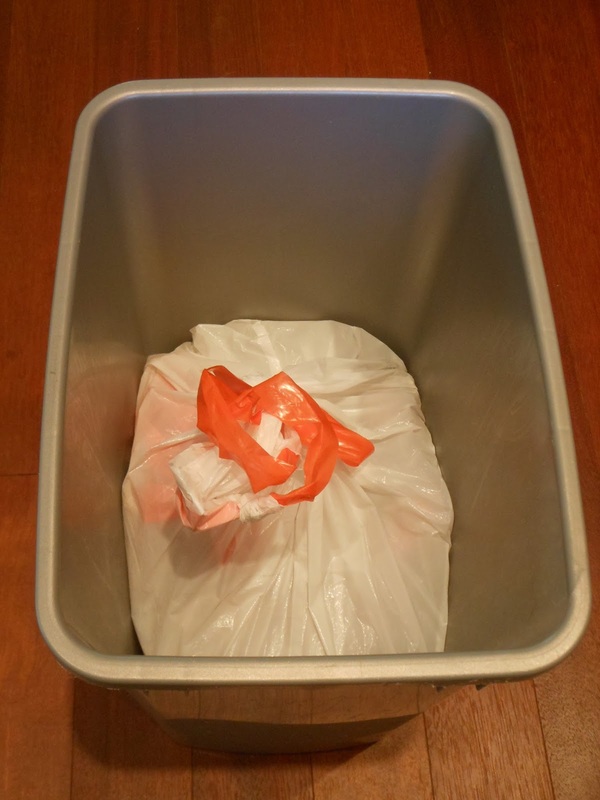 Arrange two large plastic bags, one inside the other, in a rigid container (such as a recycle bin) so that the tops of the bags hang out over the sides of the container. 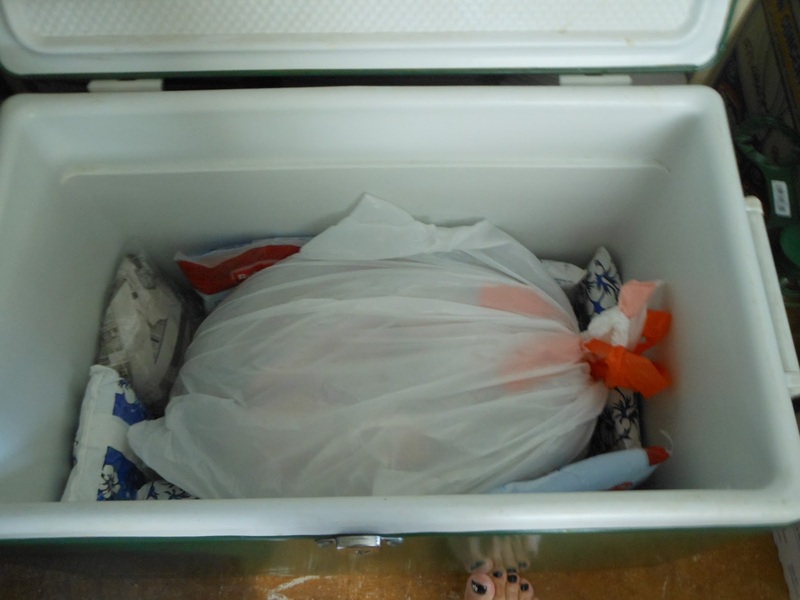 Place the turkey into the innermost bag, making sure that the tops of both bags are still outside the rim of the container. Use ice cubes or crushed ice to increase the volume of the brine solution to approximately 9.5 l (or 2½ gal). 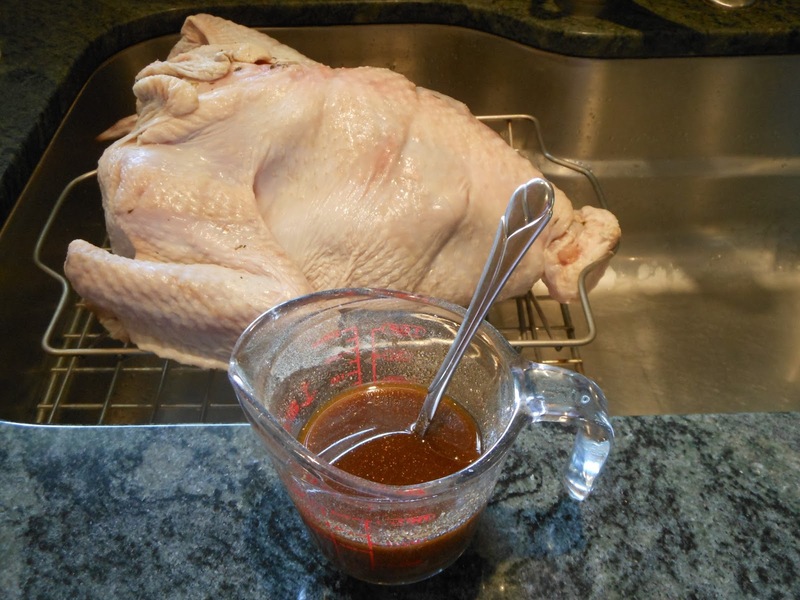 Pour the iced brine solution over the turkey. 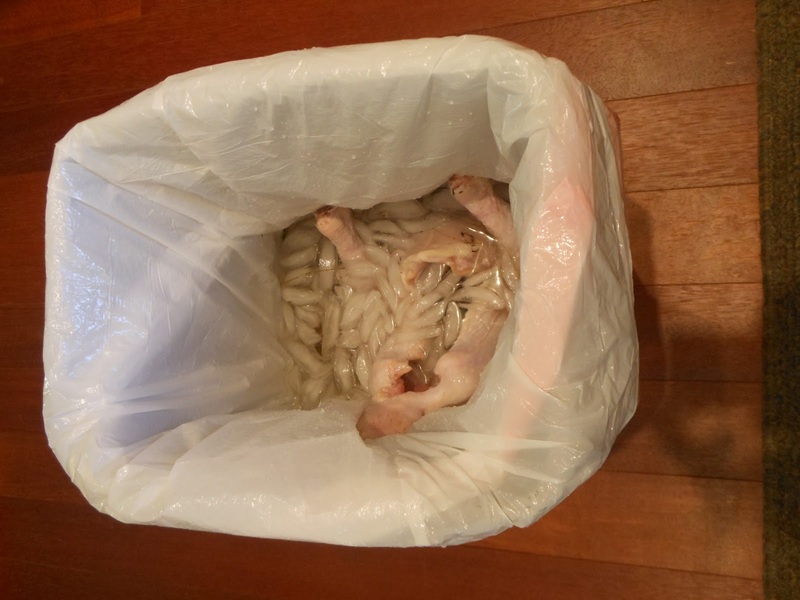 Take the top of the inner plastic bag and tie it off tightly, making sure to expel all the air from the bag so that the turkey is completely immersed in brine. 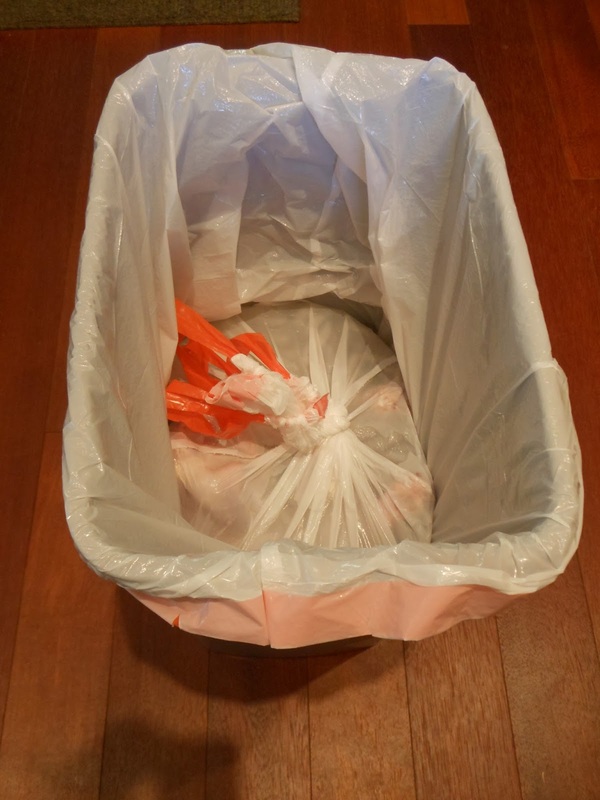 Take the top of the outer plastic bag and tie it off tightly. 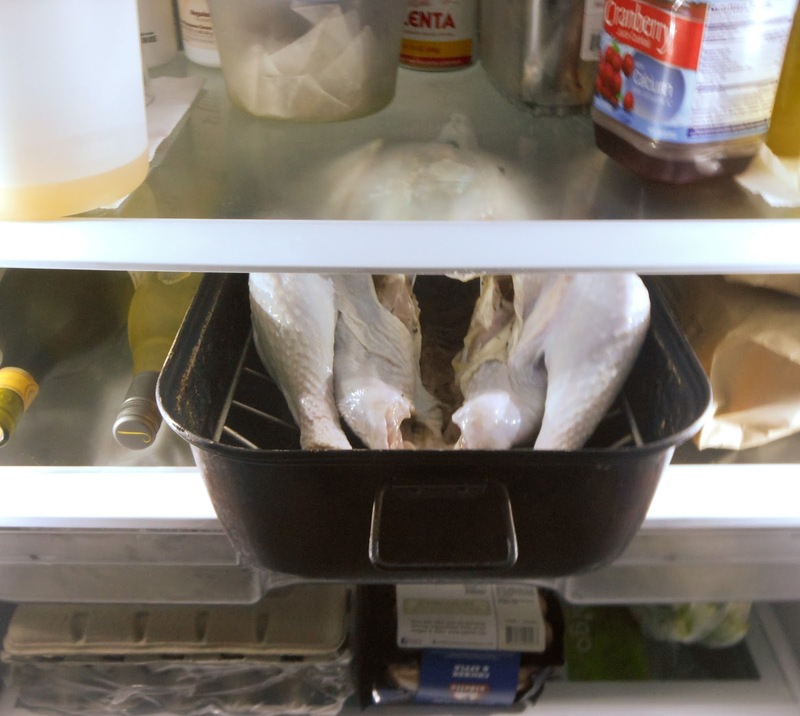 Refrigerate the turkey, breast down, for 24 hours. This can be done by placing the bagged turkey in a roasting pan in the refrigerator, or by packing it in ice in a large cooler. Remove the turkey from the plastic bags and rinse it well, removing as much as possible of the thyme leaves, which stick to the skin and flesh. Place the turkey, breast up, onto a rack in a roasting pan and place it into the refrigerator for 24 hours. At 9 to 10 hours before serving, remove the turkey from the refrigerator and place it on a large sheet of strong aluminum foil. Combine the salt with the powdered garlic, dried onion, paprika, white pepper, ginger, and sage and mix well. Use approximately 1 tablespoon of the mixture to dust inside the cavity of the turkey. Add the olive oil to the remaining seasoning mixture and use it to baste the turkey all over, as well as under the skin of the breast. 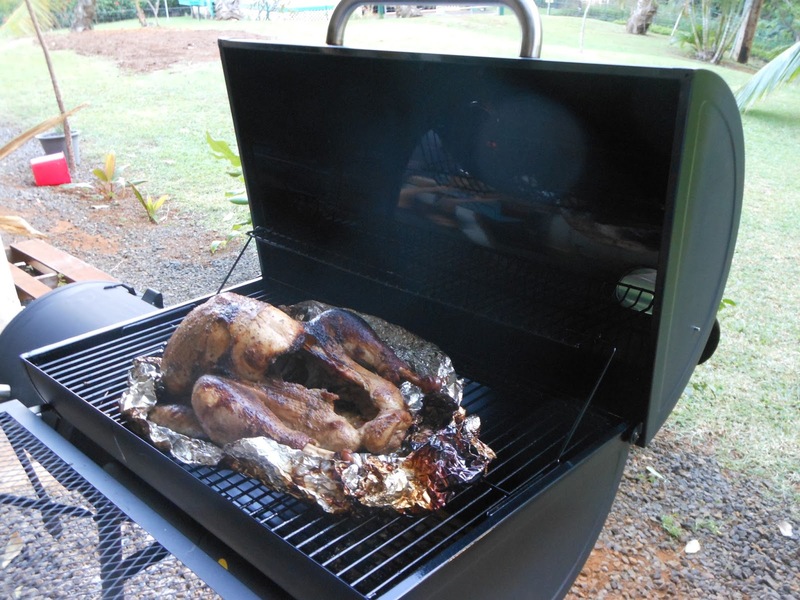 Let the turkey rest, breast up, on the foil and equilibrate to room temperature until the smoker is ready. At 8 hours before serving, ignite the barbecue coals and allow them to burn until they start to turn white. Place one soaked log or the equivalent in chunks onto the coals and allow them to begin smoking. Measure the temperature in the smoking chamber or in the barbecue kettle. 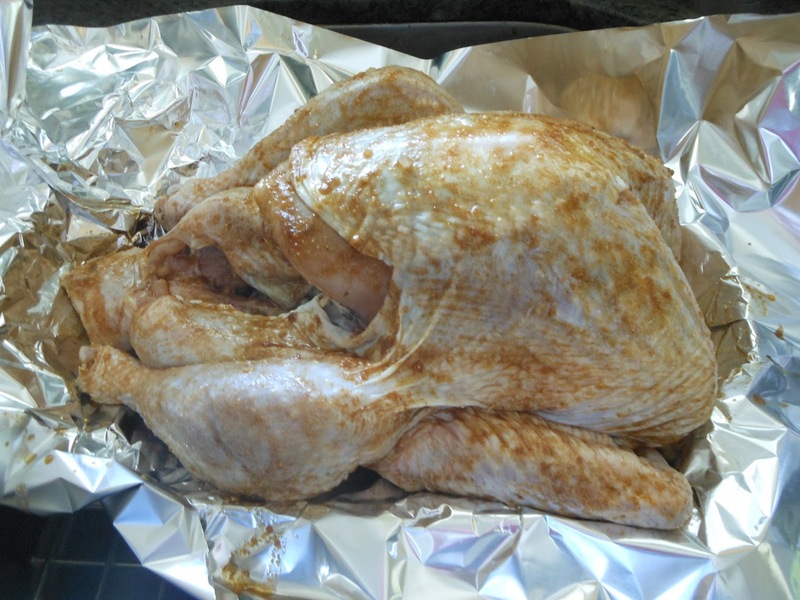 When the cooking temperature reaches 107°C (or 225°F), wrap the foil around the turkey and place it, breast up, in the smoking chamber or in the barbecue rack and reclose the cover. 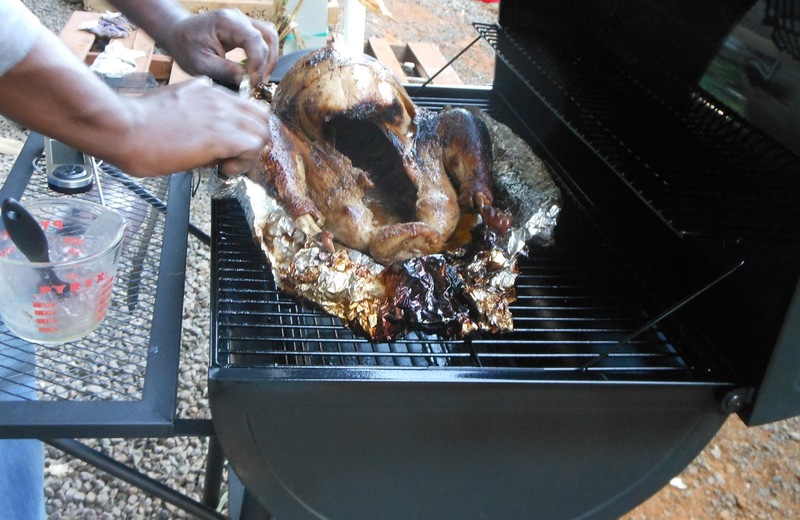 Maintain the temperature in the smoking chamber at or slightly above 107°C (or 225°F), adding more soaked wood as necessary, and smoke the turkey for 6 hours before opening the foil. Melt the butter and use it to baste the turkey for the remainder of the cooking time. When the internal temperature of the thigh is 77°C (or 170°F) and that of the breast is 71°C (or 160°F), remove the turkey from the smoker, cover it again with the foil, and allow it to rest for at least half an hour before serving. It is notoriously difficult to finish off a whole turkey. And yet it is absurdly easy to make soup from the bones, wings, extra meat, and the neck, heart, liver, and gizzard. Three-quarters fill a soup pot, bring the water to a boil, and put all of the turkey parts and leftovers into it. Add peppercorns, onion, celery, carrot and basil or thyme and simmer for 2 or 3 hours. The brined turkey will release some salt, but taste to see if it needs more. Separate the broth from the meat, aromatics, and fat. 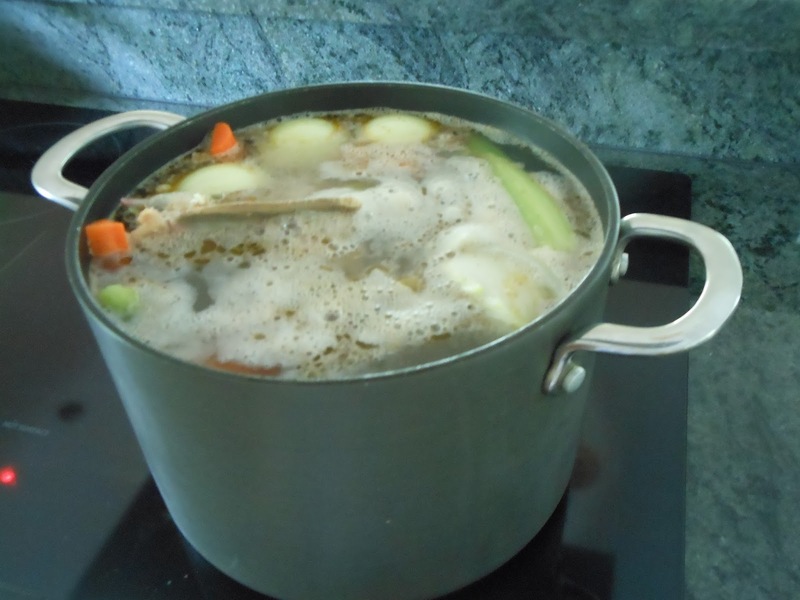 You will have a rich broth as a base for a delicious home-made soup.